What would it take for Google to decline? Granted, there were some thoughtful responses that probed Google’s complacence and ongoing alienation of its important demographics (advertisers, developers – note: not end-users). But I think the issue isn’t so much that Google has gotten fat and happy and turned into Microsoft 2.0 (riding Search, Maps and Gmail the same way Ballmer et al rode Windows XP and Office). Rather, the issue is that Google is desperate. Odd word choice? Not really – Wired picked up on it recently, too, with the keen observation that the middling Google+ has left Google clinging to ever-declining per-click costs while trying to find something – anything – to help it keep pace with rivals such as Facebook, that, despite having nowhere near Google’s profits, have arguably staked out a better slice of smartphone attention spans. I have often made fun of Facebook for being essentially a channeling of some of the best talents in computer science toward the end of designing hamburger buttons and click-by-accident advertising, but I admit that its new mobile strategy – discrete offerings for messaging, news, etc. – amplifies the threats to Google’s Web-centric business model that have always resided in walled-garden apps. I would go a step further and say that Google is like a church or a cathedral. That is, it is frequently visited, assumed to be a mainstay of the cultural fabric regardless of external economic conditions and – most importantly – it collects little to no money from any of the end users who interact with it. Sure, parishioners may make a slight donation to the local church, but the real funding comes from other sources; likewise, Joe Surfer doesn’t directly pay Google for anything, with the possible exception of a buck or two for extra Google Drive space or Google Play Music All Access. Hence, the actual business of Google is abstracted from consumers, who end up spending little or no time contemplating how or why it could go belly up – it’s not like they can point to reduced foot traffic or ridiculous clearance sales as harbingers of decline. -Let’s start with Android. Android was a defensive land grab to stop Microsoft and then Apple from shutting Google out of mobile. It has succeeded in terms of worldwide adoption, but it confers on Google nowhere near the profits that iOS has on Apple. Maybe that’s not a fair comparison, but it’s symbolic of how Android was never designed from the ground up as a sustainable business but as a vehicle for legacy Google services (there hasn’t been a really great new Google service since Maps in 2005). As such, Google is always tinkering with Android to make it less like an open source project and more like its own Google service. Peter Bright’s article on forking Android understandably struck a nerve with Google, which is awkwardly trying to maintain Android’s chief competitive advantage (no licensing fees, tons of customization possibilities for OEMs and carriers) while bringing it further under Mountain View’s umbrella. -One of the best revelations of the ongoing Samsung-Apple legal battle is that Samsung really would like to move on from Android. Samsung isn’t a great leader, but the fact that it would even consider something as nascent as Tizen to take the place of Android on its smartphones lines is telling. 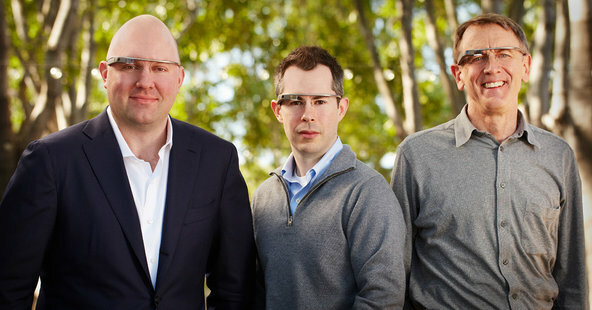 -Google Glass reeks of desperation. Jay Yarow of Business Insider insisted that Google botched Glass’ launch, ensuring that it would never take its apparently rightful place as the successor to the iPad as the next big thing in consumer tech. It’s a computer for the face, with no obvious use case as yet, a crazy price tag, and understandable cultural stigma. Tech media were wrong to puff it up as the Next Big Thing, but consider also the absurdity of this situation: Google is trying to sell a terrible HUD in order to get out ahead of the competition, like Apple did to much better effect with the iPod and then the iPhone. -It’s not just Glass, either. The Nest acqusition, the Boston Dynamics aquisition, and the obsession with “sci-fi” projects at GoogleX. – Google could be looked at as “shooting for the moon.” Or, it could be viewed instead as desperately trying to find any revenue stream alternative to mobile ads, which just don’t work like desktop ones do and, moreover, are subject to intense competition from social networks and messaging platforms. Trying to actualize the fantasies of sci-fi is not forward-looking; it is, by definition, backward-looking, with respect to someone’s text or vision about what was possible in the past. If someone created a real Death Star today, it would be impressive – as a testament to madness. Why would someone exert such enormous, concerted effort at recreating a technology conceived for recreational purposes in the 1970s, by individuals who had no idea that smartphones, MP3s, Bluetooth, Wi-Fi, and on on would be invented? To analyze sci-fi is often to analyze what it doesn’t conceive of. I watched Gattaca recently, a 1997 movie with a setting in the far future. What was in this high-tech future? Big, hulking desktop PCs and keyboards. Sci-fi is the product of constrained imagination (“the future is hard to predict” – Captain Obvious), but imitating it is even more self-defeating. For this reason, I am immensely pessimistic about the prospects of any of Google’s top-secret projects being a breakthrough that would expand its business or appeal in meaningful ways. Sci-fi is a small porthole on the future. -Google’s customers are advertisers and other businesses, not individuals. It reaches the latter by its presence on platforms that belong to the former – think its default search engine deals for Firefox and Safari. There’s not any real competition on those fronts for now – Bing is good but has lithe mindshare, and Yahoo is still locked into its deal with Microsoft. But Marissa Mayer is driven to displace Google on iOS, and Apple and Yahoo have a good relationship (Yahoo provides the data for Weather on iOS, for example). As MG Siegler has pointed out, it seems implausible that Apple would go on subsidizing Google, enabling it to make so much money off of iOS, money that it can channel into Android. -Once one gets into the “Google isn’t invulnerable” mindset, it’s easy to see everything as a weakness, sometimes without good reason. But think about its efforts to bring Chrome OS apps to mobile devices. Such a tack seems defensive – a way to halt the decline of the Web and keep matters squarely in the realm of JS, HTML and CSS. I’ve often argued that Chrome OS is more of a breakthrough than Android (it has the potential to disrupt both the business model of Windows PCs and the essential appeal of tablets), but it looks like it could turn into just a moat for Google’s existing (and, to be fair, highly profitable, at least for now) Web businesses. -Google+ has become the DNA of Google services. Its profile system is a way of indexing Internet users. It has succeeded in helping Google collect more nuanced data, even if it hasn’t exactly done much to blunt the impact of Twitter, Facebook, and others. But now that Vic Gundotra is leaving, Google+ looks weirdly quaint – like nothing more than Gundotra’s messy senior project for getting hired by another firm. There are already rumors that the Google+ team will be split up and sent to other projects (in the same way that the Google Reader team was once chopped up to work on Google’s initial forays into social). Look, Google isn’t going to turn into AOL or Yahoo. But it should be increasingly apparent that Google is not synonymous with the Internet at large, and is not guaranteed to constantly occupy so much mind share.